I'm moving up from a KTM 390/Royal Enfield. Will these be too much to handle? Which one is easier? Both the Triumph Street Triple and the Kawasaki Z800 have been designed to be easy everyday motorcycles for a relatively inexperienced rider to enjoy. But with enough performance on tap to excite a more experienced hand. They both have exceptionally smooth and progressive power deliveries that build rider confidence quickly and makes them both surprisingly easy to ride. With bigger motorcycles the one thing most people are concerned with besides power is weight and the Street Triple is lighter than the Z800 by almost 50kg but the Kawasaki hides this weight well and out on the road you'd be hard pressed to tell the difference. The lighter weight of the Triumph is only evident in high speed direction changes or when flicking it from side to side through corners. In town they are both easy to get along with. One thing to consider is the taller first gear of the Triumph which requires a fair deal of clutch slippage when pulling away from a standstill as well as when crawling through stop-go traffic. On our ride through Pune city traffic on the way to photographing this story, I found this quite annoying and though the clutch held up without fade or decay for the short crawl, I cannot say right now how well it might survive that kind of punishment on a daily basis. If you will be riding through traffic a lot then this is certainly a point to keep in mind. What is the real difference between riding a triple cylinder and an inline four, then? Traditionally an inline four revs higher because it makes peak power and torque higher in the rev range as compared to a triple. The triple on the other hand would rev to a lower ceiling and make peak power lower and so forth. The reason is that for a given displacement fewer cylinders automatically means bigger pistons. Which in turn means that maximum piston speeds limit the redline. On the other hand, while fours are said to make power at high revs very nicely, triples are said to have some of that rev-ability and high rev power combined with the hefty low-end torque traditionally attributed to twins. If all this makes your head spin faster than it should then don't fret in this case it counts for little. Kawasaki has spent a lot of time and effort to make the Z800 quite unlike a traditional four cylinder engine and so it doesn't rev as high and with the displacement advantage there is plenty of low down torque. It actually ends up making 113PS, 1,650rpm lower than the Street Triple. On the other hand the 106PS Triumph three pot 675cc engine is a detuned version of the 128PS Daytona supersport. It's quite rev happy and it's this engine that will have you chasing the flashing blue lights of the limiter more oftenbetween these two. It's a similar upside down story with torque figures as well and the Kawasaki makes better torque lower down in the rev range than the Triumph. This makes the Kawasaki a more tractable engine and gives it a sort of one-gear ability. What I mean is that it's possible to potter around town in just one gear, and even sixth gear pulls cleanly from as low as 30kmph all the way to over 200kmph. While the Street can also trundle around quite well if needed, it can't match the pull of the Kawasaki from such low speeds in top gear and only wakes up at around 45kmph. The roads in and around my home are not the best, which one will handle the rough stuff better? Suspension technology has come a long way and though both have suspension setups that are tuned to give good sporty handling they don't compromise ride quality. The difference is that the Kawasaki is slightly on the softer side so it tends to wallow just a little in corners while the Triumph is set up more on the sporty side and is the more planted of the two. Both bikes absorb a fair deal of the bumps and undulations from our poor roads and neither ever became a handful on our ride. The softer setup of the Kawasaki gives it slightly better ride quality over the really bad stuff while the Triumph counters this with its light weight and it's easier to stand up in the saddle to go over bad sections of broken tarmac. The Kawasaki has rebound damping and preload adjustability for both the 41mm upside down forks and the rear monoshock while the Triumph only has preload adjustment on the rear monoshock while its 41mm upside down forks are non-adjustable. Stuff the practical information. Which one is faster? I want performance! If you think our previous answers left you confused as to which one to pick over the other and you were expecting the performance numbers to give you a clearer picture then you're in for a surprise. 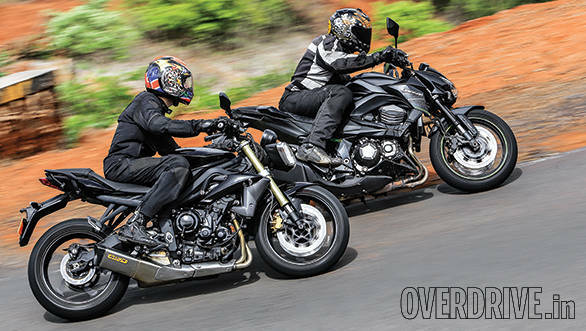 Though the stats will say that the Street Triple is 50kg lighter or the Kawasaki has over 20Nm more torque or that the Z800 is shorter geared than the Street, the test figures tell a different story. 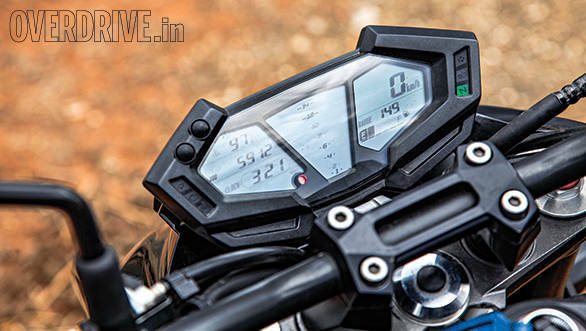 Their 0 -100kmph times are near identical and both bikes hit the tonne around the three and a half second mark, give or take. The same can be said for their quarter mile runs as well. The only telling figure is the top gear accelerations figures where the Z800 bests the Street Triple with its lower gearing. 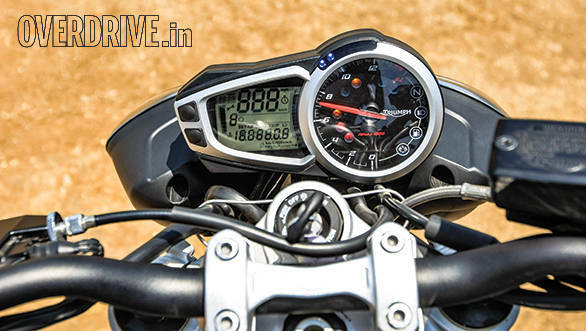 Their top speeds too are in excess of 200kmph in a straight line and frankly beyond that you're just picking at nits or bragging to your buddies over a cold one. In the real word they both are just as fast as each other. What about warranty coverage and spare parts? Which one is easier to maintain and live with? Both manufacturers offer two year warranty coverage though Kawasaki stipulates a 30000km limit whereas Triumph is an unlimited mileage warranty. You will need to get the Kawasaki in for its first service at 1000 kilometer while the Triumph needs to come in at 800 kilometers. Both first services will cost you around Rs 6,000 on average. Thereafter you would need to bring both bikes in, every year or every 10,000 kilometers with the Triumph requiring a 'bigger service' (where they replace spark plugs, o-rings, etc) every alternate year. The cost of spare parts for both motorcycles is fairly reasonable too. For example a new set of brake pads will set you back between Rs 2500 to Rs 3000. All Kawasaki spares will arrive in about 15 days while Triumph stocks all running parts for most of their motorcycles. Accident repair, or major parts replacement will take longer to arrive for both too. The fact that Triumph stocks running parts and Kawasaki doesn't should make life a little simpler with the British bike. But what might just make your decision easier is this. 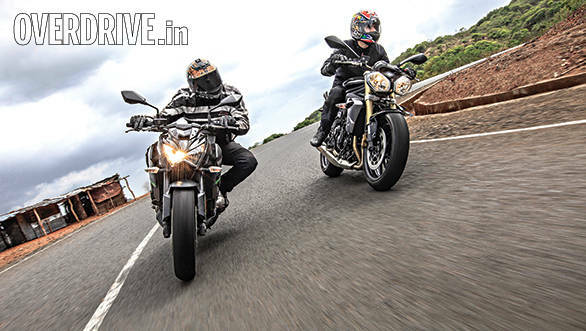 Kawasaki has two dealerships in India  one in Pune and the other in Delhi. Triumph on the other hand, has gone on a dealership spree, opening eight dealerships since January this year. So there are more chances you will find a Triumph dealership near you. *The loss of power dramatically changes the outcome of this story. At 79PS, the Street Triple is extremely hard to justify as a valid purchase since you get significantly less power than the Kawasaki. 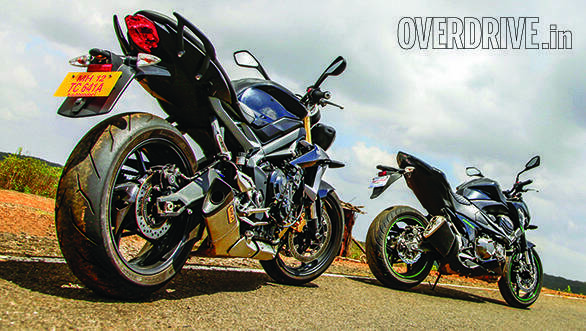 We do believe the Street Triple is the sportier feeling of the two motorcycles in the chassis department, but then instead of the Z800, I'd point you to the Ninja 650, which has 7PS less peak power, one cylinder less and a less sharp chassis but is a whopping Rs 4 lakh cheaper to acquire and therefore a much, much better deal. 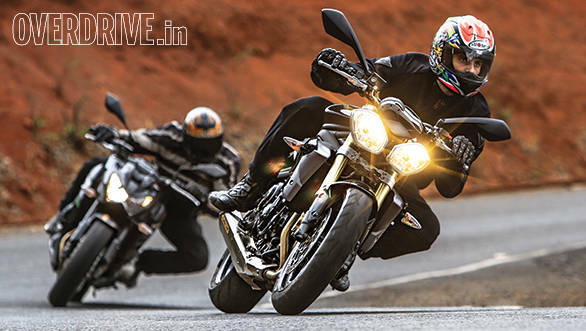 This story explains how the Street Triple lost 25 per cent power.